Raffles are not only a great way to get funding for your cause, your participants also get to go home with awesome prizes — it’s a win-win situation! But, fundraising is hard and demanding enough, add designing raffle tickets to it and you can quickly get overwhelmed. We hear you! 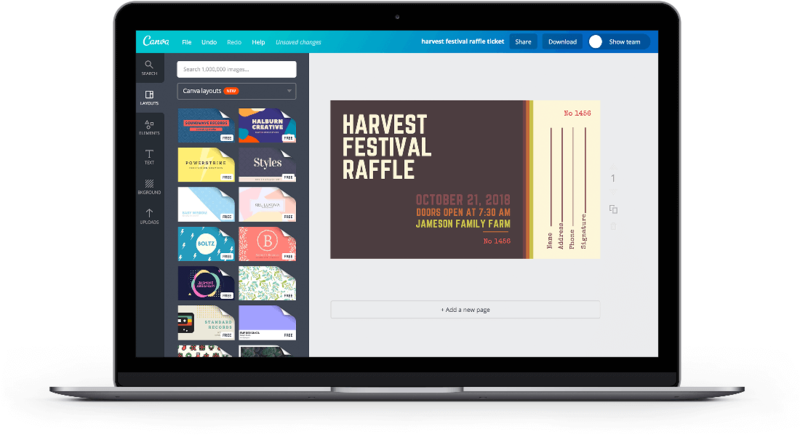 With Canva, you can design awesome raffle tickets even with little to no design experience and without having to shell out a large sum — you can keep that to aid your cause! The secret lies in Canva’s collection of amazing raffle ticket templates created by our awesome professional designers. From there, it’s a matter of choosing your favorite ticket template then customizing it to perfection. Afterwards, download your design or share it online to drum up more attention for your cause. Create a new Canva account to get started with your own Raffle Ticket design. If your organization often holds fundraisers, you probably won’t want to start your design from scratch. Every design you create in Canva can be re-opened and edited as many times as you like. You won’t need to hire a graphic designer to make small changes such as editing details like date, venue and event title. Simply make the changes to your original design and download it again. You can choose to save your design as a print-ready PDF, high-res PNG image file, or a web-optimized JPEG file perfect for sharing online. Canva’s drag and drop design features makes it easy to add your organization’s brand assets like logos and colors easily. Simply go to the uploads pane and choose a JPEG, PNG or SVG version of your logo to add to your design. Drag your logo to where it needs to be and resize by clicking or dragging on its edges. Change the template color scheme to your brand palette by clicking the color tool on the Canva toolbar. Pick the correct hue from the color wheel or input your color hexcode into the box. Canva for Work users have the option to build their Brand Kit in Canva which stores their brand assets like logos, palettes and even custom fonts, ready to be applied to all designs. Canva for Work is available for free for non-profit organizations. Learn more here. Don’t try to do everything on your own! Get your team’s input by giving them editing access to your design. Click the “Share” button, tick the box giving them editing access, then send them the link. All your designs are stored on cloud so you and your colleagues can access them anytime, from any desktop, laptop, iPhone, iPad or Android device.